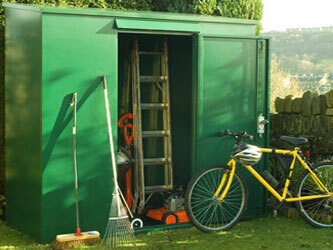 The Trojan provides the perfect solution to all your garden and outdoor storage needs. Made from high quality galvanised steel and coated with a tough polyester textured weatherproof coating, protecting against rust for a minimum of 10 years. Big enough for you to walk inside, the door opens on the right hand side and has a rain guard to prevent rain water from getting inside the unit when the door is opened. Available in Dark Green, Dark Brown and Ivory. Installation must be on a firm level surface.